Video stores are dying. But most of you don’t care. You’ve got your Netflix and your DVR, so why deal with VHS tapes or scratched DVDs? Why deal with the grumpy guy at the worn-down independent video store? That grumpy guy is Waring Wax, and he’s usually too drunk to worry about his declining business at Star Video, let alone his quickly evolving extinction in popular culture. But everything changes in his small college town when a bright and shiny Blockbuster Video opens nearby: Clearly, this means war. So, Waring enlists the help of his two reluctant employees, charismatic but conflicted Alaura and desperate virgin Jeff, to hatch a series of wild schemes to save their little store. Together, these three misfits try to save Star Video while confronting, among other things, Waring’s self-destructive tendencies, a life training cult, corporate bicycle gangs, and a Hollywood director who constantly sees the ghost of Alfred Hitchcock. 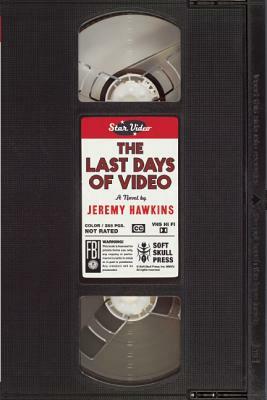 The Last Days of Video is a hilarious elegy for a bygone era, a quirky and charming story of redemption for a group of loveable cinema freaks, and a love letter to the art of the movies. This is the Lucky Jim of video store novels. A comic page-turner — often really funny — with an originality and tenderness not often seen in first novels. This hilarious novel manages to love, dissect, and make fun of our culture all at once. Jeremy Hawkins’ particular genius is in understanding that people are never more sympathetic than when they aren’t getting what they want. This whole book is saturated in loss, and yet I laughed through every page. This is a wonderful book! I laughed at least once a page. And the characters are so fresh and sad and eager. This book should be put in a time capsule. The Last Days of Video is like the literary missing link, about a time when things were really real. The Last Days of Video is, as the title suggests, an elegy for an era, but it’s an era that’s going out with a lot of kicking and screaming. Funny, raucous, and deliciously irreverent, Jeremy Hawkins’s debut novel offers up an engaging cast of characters who bicker and lust and love their way through the roller coaster ride of Star Video’s final days. This generous, big-hearted novel is a joy to read. [A] funny, surprisingly tender debut novel . . . [T[he characters have enough heart and vivid imperfections to make their story irresistibly engaging . . . They careen from one encounter to another, propelled by a generous dose of nostalgia, loud humor and narrative energy, but they’re given the depth to make casually beautiful phrases ring true . . . A novel that manages to be both very funny and very sad, with an unrepentant belief in both movies and love served with a cleverness and irreverence that are difficult to resist. [W]hat sets this debut novel apart is how Hawkins effortlessly reveals the inner workings of his characters . . . The novel is riddled with film references and easily lambastes the sneering superiority of cinephiles, while still preserving a sense of wonder for the magic of movies. The Last Days of Video is an unapologetic, quirky, and surprisingly moving elegy for the passing of the local rental hangouts. Funny . . . The author has a good time gently poking fun at the video-store culture that produced Quentin Tarantino. Charming and fun, The Last Days of Video is a great debut. 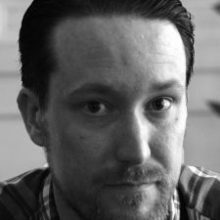 JEREMY HAWKINS earned an MFA in Fiction from the University of North Carolina, Wilmington. He is the founder and lead editor of The Distillery, a web-based editing service. Hawkins is also an independent bookseller at Flyleaf Books and teaches creative writing at the Carrboro ArtsCenter. He worked for almost ten years at VisArt Video, a family-owned chain of video stores in Chapel Hill/Duram, North Carolina.